Bed bugs have again returned to the Maxine Lewis Memorial Homeless Shelter, forcing the Community Action Partnership of San Luis Obispo (CAPSLO) to close part of the facility. A dog trained to sniff bed bugs found an adult bug and several eggs in a 22-bed dormitory for men Monday afternoon. CAPSLO staff sealed off the dormitory, but kept the rest of the shelter open. The partial closure marks the third time in the past two months CAPSLO has had to deny homeless individuals beds due to bed bug infestations. CAPSLO officials have claimed they first learned of the bed bug problem on July 8 and that the insects did not pose health risks. But homeless services staff quarantined a man in June who contracted MRSA, a severe staphylococcus infection, from bed bug bites inside the shelter. 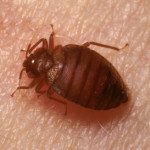 Since then, bed bugs have bitten numerous other CAPSLO clients, have spread to the Prado Day Center and have caused another client to contract MRSA. During the partial closure, CAPSLO staff plans to allow case management clients and those who have spent fewer than 30 nights in the shelter to sleep in the remaining 28 beds. Others may be able to sleep on cots or the dining room floor. CAPSLO plans to have a pest control company treat the shelter with heat this week to rid the bed bugs. During the first closure, CAPSLO used bug spray to eliminate the critters. But, clients reported finding more bed bugs the night the shelter reopened. CAPSLO tented the shelter for fumigation and used heat treatment during the second closure. CAP SLO are telling you self-serving stories. Again. They say they found the bugs on Monday. but the clients were not told, nor was anything done about it until late Tuesday night. And cots were never offered or mentioned – Over a dozen people now sleep on cold concrete / linoleum floors. If CAP SLO were as concerned as they like the media to think. this would be over by now. You are not getting even half the full picture. They need to ask the homeless to give up all their current clothing and give them gently used new clothes. Likewise every sleeping bag must be treated. All the pillows have to be replaced as the bugs can hide in the pillows. Don’t know what sort of mattresses they have but until this job is done right, the bugs are there to stay. Likewise if they keep sending people to motels, the beds will come back with the clients. It’s time for the gov to allow DDT use for bed bugs, nothing else seems to work like DDT does. Just allow every hotel, motel, shelter etc to give it go with strict guide lines to protect the environment. OOppps, I forgot that SLO can’t be trusted to follow those guide lines, an employee might get angry and dumb the stuff all over on public property and then the city will cover it up rather than clean it up. Does that guy still have his job, sure he does. I am involved with a homeless elderly charity in Africa, and they specialize in taking the destitute off the streets and giving them a place to live… that said, it was originally desired that they give up their clothing and were provided NEW, custom-tailored (labor is cheap) clothes. For the men, two suits, the women, two dresses, with accompanying garments. In the end, they were NEVER able to get the old, crappy clothes (to incinerate), as the elderly homeless did not want to give up ANY of their possessions. In fact, most are quite paranoid about just leaving their “stuff” where others would “steal” them. Now remember, this is Africa, so the clothing and possessions are really, really in poor, unsanitary condition. But it was still theirs. I say this because it is not easy to ask them to give up anything at this point in their lives. In fact, some of the elderly in this African homeless charity left because they felt “guilty” for having a bed, toilets, etc. Truly an education. Not sure our homeless are similar, as these people are homeless because their kids (usually) were killed in conflicts/wars, and over there, family IS your social security. Family and Christian Churches, really. Wouldn’t it be highly likely that someone who worked at homeless services would end up carrying home a few “free riders”? I think if we just monitor Adam Hill at BOS meetings to see how much he is scratching, we can get an idea of the current extent of the bedbug issue at homeless services. Oh, Mary… So many potential zingers to apply here. I’ll just leave it alone. I think enough has been said about that guy here. City of SLO, County of SLO and Housing Authority are picking up the tab for this infestation which so far has cost over $20,000 according to the Tribune. Lots of extra government money floating around I guess. This will go on forever! At least it is helping the business community: the pest control co, laundry suppliers, janitorial services, staff overtime, etc. Hey Dee, contact Camp Roberts, maybe they have extra metal bunks they can sell you and save you $50,000… You’re welcome! They will never get rid of the bugs unless they fumigate the entire property, the creek next door and the rest of this town. And gather up ALL the clothing from everyone who goes there and burn it. Give them all new (gently used) clothing, free of bed bugs and for another yeaar or so, you might find relief from these parasites, the bugs that is. The city should move everyone somewhere else, maybe the Ludwick Center? while they get serious about ending this infestation. Maybe put them up in the airbnb places that are all over town? Get the homeless out of the homeless ghetto and into neighborhoods! That will really demonstrate the efficacy of vacation rentals. They followed up fumigation with checks using the dog to sniff them out. Unless the dog is prone to error, that means they probably did get them with the fumigation. Given what they have already done, I suspect that the bedbugs are being reintroduced afterwards by at least one of their homeless clients. The problem is figuring out which one and how. That is not an easy task given that they come and go and that they may be getting them from other places they stay in between. Generally speaking however, bed bugs don’t do well in outdoor environments. While the creeks and other unofficial camping and hangout places may be a source for other problems, it is very unlikely they are providing a source for bedbugs. As for the Ludwig Center, were you being facetious? You do know that it is used for several other programs by the general public — and one of CAPSLO’s Head Start programs too? I am sure that all the people who use it would appreciate the increased risk of exposure to bedbugs later on. The creek and bushes are probably loaded with bed bugs that feast on those who sleep there. A never ending problem that will continue to embrace the SMART GROWTH principles. Donating blood is nothing new and these little critters don’t eat much. good night.